Fluorite Tumbled Stones - Fluorescent! 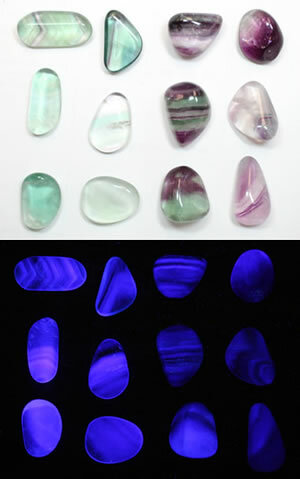 Home » Rock Tumbling Library » Fluorite Tumbled Stones - Fluorescent! The top photo shows some nice tumbled fluorite in purple, green and clear. These same stones are shown in the bottom image under shortwave ultraviolet light. All of the stones glow a beautiful purple-blue color under UV light. The banding details in the stones are still clearly visible under UV light. Fluorite is one of our favorite minerals. We enjoy how it can have "color bands" that range from colorless through yellow, green, blue and purple. The various colors in fluorite are caused by impurities in the mineral. These banded specimens of fluorite make beautiful tumbled stones. If we take fluorite into a dark room we are unable to see it. However, if we have an ultraviolet light (which produces light that is invisible to humans) and shine it on the fluorite, the fluorite will probably glow a beautiful blue-purple in the dark as long as the ultraviolet light is shining on it. The pair of photographs at right show banded fluorite under normal light (top photo) and in the dark under ultraviolet light (bottom photo). You can see how the fluorite glows a wonderful blue-purple color under UV light and how the bands in the fluorite are still visible. Most specimens of fluorite will display a blue-purple fluorescence under short-wave and long-wave ultraviolet illumination. Rarely specimens of fluorite will glow white, cream or another color. A small percentage of fluorite specimens will not fluoresce under ultraviolet light. The "black lights" sold for party use in retail stores produce weak long wave UV. Only exceptional pieces of fluorite will produce a nice fluorescence under that wave length. Be sure to read the safety instructions provided with any UV lamp. UV radiation can be harmful. One of the first people to observe the ability of fluorite to glow under ultraviolet illumination was George Gabriel Stokes in 1852. He called the ability of a material to emit light under UV illumination "fluorescence" after the mineral fluorite, in which he first observed it. That name has been widely accepted. It is now used in the fields of commercial lighting, mineralogy, gemology, biology, material science and many others. This wonderful photograph of fluorescent minerals was created by Dr. Hannes Grobe and is used here under a Creative Commons license. It appears in an article about fluorescent minerals on Geology.com. RockTumbler.com and Geology.com are both GeoShops websites. A beam of light is actually a stream of very tiny particles known as "photons." Photons are in the same size range as the electrons in an atom. When a beam of light illuminates a material, photons will strike electrons in the atoms of that material. The electrons of some materials will become energized by these photon impacts and temporarily jump up to a higher orbital in the atomic structure of the material. When these electrons fall back to their original orbital a small amount of light is released in the form of a stream of photons. The wavelength of that emitted light is usually different from the wavelength of the illuminating light, and that gives it a different color to the eye of a human observer. When we go into a dark room we can't see specimens of fluorite. However, if we switch on an ultraviolet lamp and shine it on the fluorite, that light excites electrons in the fluorite, and when those electrons lose their excitement they emit visible light in wavelengths (colors) that humans can see. Most materials do not fluoresce under ultraviolet light. Those that do fluoresce usually contain an impurity or a defect in their crystalline structure. Fluorescence in fluorite is thought to be caused by the presence of rare earth elements such as yttrium, europium or samarium within the mineral. The banding in the ultraviolet photo could be caused by variations in the amounts of these elements in the fluorite specimens. 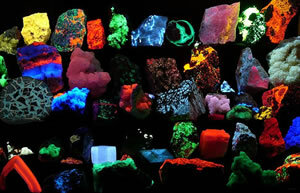 To learn more about fluorescent minerals see the photograph at the bottom of the right column.